The Martian Conqueror | Warped Factor - Words in the Key of Geek. It’s amazing what you can do with duct tape and tarpaulin. I’ve just got back from seeing the latest Matt Damon film “The Martian”. Now, I’m not a major fan of Matt Damon, the only thing he’d done before that I liked was “Adjustment Bureau” which really doesn’t go where you expect it to. I would recommend that, but “The Martian” I would recommend even more highly. When I saw the advert I thought that it would be half good, the fact that hubby and daughter also felt the same way and wanted to go meant we had to make a family trip, so we did. Well this movie wasn’t half good, it was totally good. I loved it from start to finish. There’s a meme going round the internet saying that the amount of money Hollywood has spent rescuing Matt Damon (“Saving Private Ryan”, “Interstellar”, “The Martian”) we really could have sent him to the moon. Until this movie I would have said that the second option was of more value, but “The Martian” has changed my mind - well that and the fact that he’s the voice of Cale Tucker in “Titan A.E.”, a much underrated movie I’ve raved about here before. 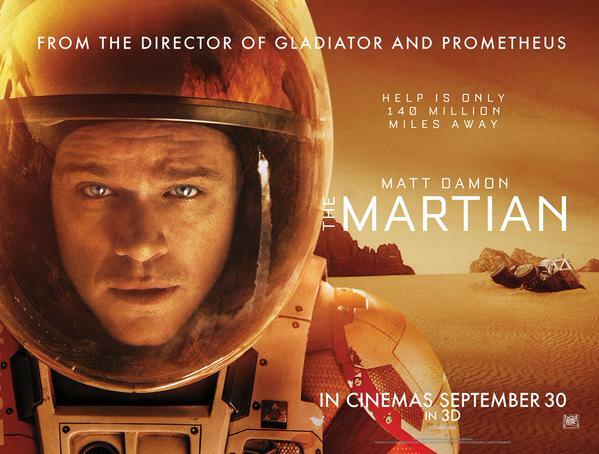 The story of “The Martian” is that six astronauts are on a mission on Mars, a big storm comes in, they have to evacuate, one of their number (Matt Damon) gets knocked off his feet and his bio-metrics go off, indicating that he’s dead. Of course he’s not, be a damn short film if he was wouldn’t it? So the real story is how he survives, and what NASA do, and don’t do, to get him back. There are thrills and spills and triumphs and disasters along the way. And even though you’re pretty sure how it’s all going to turn out in the end, it's such a hell of a roller coaster to get there. And what that character can do with duct tape and tarpaulin is incredible. Now I’m not going to go into detail about the film as I don’t want to ruin it for anyone, go see it, it’s brilliant. I’m now going to go all fan girl and ruin a few things anyway. Readers of stuff Tyrell and I do may just have noticed that we watch a lot of SciFi and fantasy. So if you do to, watch out for subtle references to “The Avengers”, and then there’s the in your face “Lord of the Rings” reference and the line that could only be delivered by the incomparable Sean Bean, and Sean actually survives the film which is unusual enough, though it has to be said the character’s career doesn’t survive for all the worst reasons. What was really interesting was watching who else was in there. There’s a character, Kapoor, played by Chiwetel Ejiofor. Through the entire movie, I was thinking, I’ve seen him somewhere. To be honest it was a little annoying because he was so believable in the movie that though I got flashes of some other clean shaven authority figure, possibly a cop, I just couldn’t see it. It was Tyrell on the way home that pointed out that this is the man after Mal in “Serenity”, I just IMDBed him and I’ve actually seen him in more stuff, “Murder in Mind” (when he was a cop), “Love Actually” (boo), “Inside Man” (yey!) and “Children of Men”. So he might not be the leading man, but he’s really good and worth watching. Another guy who’s not a leading man, but is good supporting actor is Benedict Wong. See “Prometheus” (but only if you have to - not great), “The Peter Serafinowicz Show” (even my underdeveloped funny bone found some giggles in that), “Sunshine” (brilliant if weird), and loads of other stuff that IMDB will tell you about that is just great. Of course, I can’t ignore the fact that Jeff Daniels is in there, he’s got the kind of back catalogue a lot of actors would kill for (even if they would have to ignore Dumb and Dumber). Then there was the one I didn’t twig, Kristen Wiig was in it! She was also really good. I blame the fact that I’ve only ever sees her in comedies and for some reason I think of her as dark haired. Anyway, The Martian - go see it. It’s brilliant. Five out of five.